Tying off skin tags at home is a proven way of removing benign growths on the face and body. It is a method that doctors regularly use to remove them and a treatment that people successfully use every day. If you want to get rid of skin tags at home, you may be considering ligation. If so, there are things you should bear in mind before you get started. Avoiding the pitfalls of skin tag treatment will increase the likelihood of a successful outcome. There are several threads that you can use to tie off a skin tag. Many people use a sewing thread because it is an easy way of cutting off skin tags, but it’s so thin that it could cut into your skin. This could cause irritation or bleeding. If that is all you have on hand, make sure not to tie it too tightly. Watch out for signs of irritation. These include excessive swelling and redness of the healthy skin. 1.3 Is Tying Off Skin Tags Dangerous? 1.3.1 Is the Removal of Skin Tags Painful? 1.4 Will the Process Be Successful? 1.4.1 How Long Does it Take to Remove a Skin Tag with Ligation? Dental floss can remove skin tags at home by tying off a skin tag with a dental floss. It is thicker than sewing thread so that it won’t cut into your skin, but it can still irritate. You still need to be careful when you are using it. If this all sounds risky, you should take a look at the TagBand Skin Tag Removal Device. It makes the ligation process a lot easier, so they will be gone in about seven days. Feel free to read the TagBand review for additional information. We will now provide a step-by-step guide on how to remove a skin tag with string or thread. Correct diagnosis. The first thing to do before tying off a skin tag is to make sure they aren’t warts. Make sure the area cleaned. Clean the area thoroughly with soap and water and then apply rubbing alcohol to the skin tag and surrounding area. This will help to prevent an infection from bacteria and germs. Tie dental floss around the stalk. The next step is to identify the stalk. Wrap the dental floss around the bottom of the stalk. Tie it securely, so it stops the circulation of blood, but not so tight that it cuts into your skin. Sterilize the area each day. You may wish to place a bandage over the skin tag so that it does not get injured or irritated by clothing or other objects. Be sure to check the area every day and re-apply alcohol to the area every day to prevent it from getting infected. Is Tying Off Skin Tags Dangerous? While there are many pain-free methods of removing skin tags, the decision to tie off skin tags can be slightly uncomfortable for some people. It is likely that the skin tag and the surrounding area will become sore. Provided that you follow the guidelines and avoid treating sensitive parts of the body, such as your testicles or genital area, it isn’t at all dangerous. Just pay close attention to how your body responds to the treatment. Is the Removal of Skin Tags Painful? It may start throbbing a little (especially for the first 15 to 20 minutes), and it will be sensitive to touch. If it does prove to be a bit painful, simply apply some ice to it, and you can also take over-the-counter pain medications to help as well, if necessary. You won’t experience unbearable pain or any bleeding. Just avoid using the ligation method, or any other treatment, if you have a swollen or infected skin tag. When you’re using this method, you will still need to be aware of how it is doing on a daily basis. Infection is a possibility when using this method, and if you notice the signs of an infection, it’s best to get seen by a doctor for further treatment. Since this method will likely cause some mild discomfort because you are cutting off blood flow to the tag, you can’t use pain as an indication of infection has set in. Instead, you need to watch for other signs. This is one of the main reasons that so many people are now using the TagBand skin tag removal device TagBand Skin Tag Removal Device. It should not get any bigger while you are waiting for it to fall off. They get their size from the amount of blood flow that is getting to them. When there is more blood flow, the skin tag will become larger. When there is less or no blood flow at all the skin tag will get smaller and die off, which is what you want to happen in this case. If it gets bigger and there is swelling, these are not good signs and it means you will want to see your doctor immediately. You also want to watch for bleeding. As long as you don’t tie the dental floss so tight that it cuts into your skin, there should be no bleeding. If you notice that it is bleeding, then it’s likely getting infected and should be looked at by a doctor. Will the Process Be Successful? Overall, tying off a skin tag is a very successful method of removal, but as with other things, failure is always a possibility. After you tie it off, over the next few days, it should get smaller and change color, going from a lighter more normal skin color to purple or black. If you don’t notice any change at all after a few days, it’s probably not working, and you may need to start again from scratch. How Long Does it Take to Remove a Skin Tag with Ligation? There’s not a specific number of days that it takes for the removal process to be completed. However, it seems that most people get results in 5 to 10 days, with a week being the average. Much depends on the size and position of the skin tag. They dry out faster when they’re smaller and in dry locations. It’s also wise to think about the area where the skin tag is located before deciding to tie it off. If it’s in an area where the skin is naturally more sensitive, like the groin area, it may be a good idea to use a different method of removal to cut down on the possibility that it might get infected. 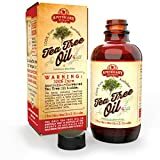 In this instance, you should consider applying some Apothecary Extracts Tea Tree Oil to the tag as this will cause it to flake off naturally. Other methods of removal may include a medical procedure, using the best over-the-counter skin tag removal products, or concocting a home remedy using a variety of ingredients from your kitchen. For example, people have been using apple cider vinegar for a number of years as a natural remedy for many different ailments. From protecting against different forms of infection to preserving their food, they have found several uses that are beneficial. Some also feel that apple cider vinegar is useful when it comes to successfully removing skin tags. They believe that the acetic acid that is contained in the apple cider vinegar will help break down the surrounding tissue which will ultimately cause the skin tag to fall away. However, just as there is no real scientific evidence proving what causes skin tags, there is also no scientific evidence proving the effectiveness of apple cider vinegar for skin tags. There have also been reports that when used on the skin, the vinegar may even remove the top layer of the skin which can lead to scarring and hyperpigmentation. Another natural remedy that has been tried for removing skin tags is oregano essential oil. This natural oil has been found to successfully remove any unsightly blemishes from the skin including moles and warts in addition to skin tags. Whenever you use essential oils on your skin, you need to be sure to sufficiently dilute the essential oil with what is called a carrier oil. A carrier oil, typically olive or coconut oil, is used to dilute the essential oil, so it is safe to be applied topically to the skin. To use oregano, you apply it directly to the skin tag you wish to remove, and it will numb and cleanse the area. You can then pull the skin tag so that the stalk is exposed, and it is easier to tie the string or dental floss around the skin tag. Tie the string at the base of the stalk and keep it in place until the skin tag falls off. TIP: Tying a double knot with the string or dental floss will create a tighter and more secure knot and hold around the skin tag. Once the skin tag falls off, you will want to continue to apply the oregano essential oil to the area at least two times per day and then dress the area when the oil has dried on the skin. Pay close attention to any color changes that occur over the next few days following treatment and keep the area covered and bandaged until it has fully healed to avoid any infection or irritation. Some methods of removal work better than others, and if you’re considering spending a bit of money on an over-the-counter product, it would be a good idea to do some research on the individual product you’re thinking about buying before you buy to make sure it has a high success rate of removal. 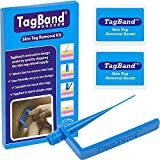 Find out what people have to say about the TagBand Skin Tag Removal Device because it could make the process a lot easier and safer for you. If you’re ever in doubt about a skin tag located on your body or about ways to remove skin tags safely, contact your doctor or another health professional and get their input on the situation.